Saint Martha, whom the Church's calendar commemorates today, engaged Jesus in one of his most famous dialogues, first reprimanding him for showing up late for her brother's funeral, then eliciting from him the powerful proclamation, I am the resurrection and the life; whoever believes in me, even if he dies, will live, and anyone who lives and believes in me will never die. In response to that, Martha made her great profession of faith, for which she is so especially honored and remembered today: Yes, Lord. I have come to believe that you are the Christ, the Son of God, the one who is coming into the world. For centuries the standard Gospel reading at most Catholic funerals, this account (John 11:19-27) has solidified Martha's status not only as one of Jesus' intimate friends, but as a disciple and an evangelizer. Yet, for most people perhaps, the Martha story which has had the deepest impact upon her reputation is the account of one of Jesus' other visits to her home, at which she provided hospitality for him and his disciples but also remonstrated with him about her sister Mary's not helping out with the household chores (Luke 10:38-42). 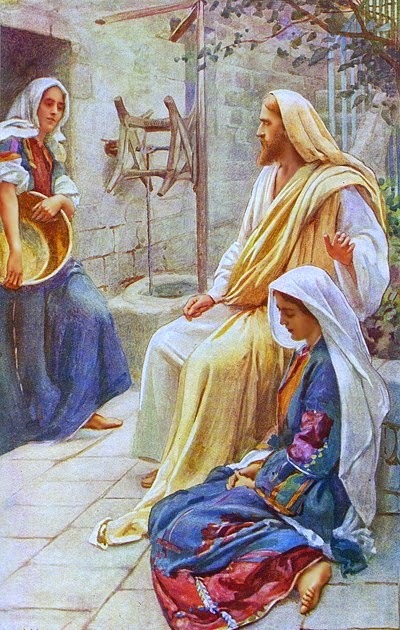 In John's account of Jesus' dining in Bethany at the home of Martha, Mary, and Lazarus (John 12:1-11), while there is no suggestion of any complaint on Martha's part, again it is Martha who does the serving, while Mary steals the spotlight by anointing Jesus' feet with expensive perfumed oil. If anything, the very obvious ordinariness of the situation and the ease with which we can all identify with one sister or other in Luke's story has guaranteed its popularity. It has also, unfortunately, allowed a certain trivialization - as, for example, the way we used to stereotype one another in seminary as either a Martha or a Mary, the religious analogue perhaps to the traditional categorization of congressmen as either "workhorses" or "showhorses." Ours is a society in which we define ourselves for the most part by our work. Of course, our society honors and rewards wealth much more than work, and there is no connection between work and wealth. But, after wealth, we seem to place the greatest value on our work. For the vast majority, it is work which provides whatever degree of respect our society allows to the non-wealthy. And, inasmuch as work has always been necessary for most people, I think Martha's complaint about her sister must have resonated with most people as just commonsense. Of course, there is more to life than work, but the work has to get done! I'm sure Jesus and his disciples wanted their dinner! So I think they valued Martha's efforts to be hospitable. (Certainly, the Church has seen Saint Martha a model of service, a sentiment evident in today's Collect. And it is no accident that the Vatican hotel - where the Pope presently lives - is named for her, Domus Santae Marthae.) Of course, Jesus' response to Martha's complaint can be heard primarily as praise of Mary for choosing the better part (and has been so employed for centuries to prioritize contemplative over active religious life), but at the same time I think that Jesus was not criticizing Martha so much as offering her some helpful advice about her priorities: Martha, you are anxious and worried about many things. Today, July 28, marks the 100th anniversary of Austria-Hungary’s declaration of war on Serbia, the official beginning of the First World War. From his Kaiservilla in Bad Ischl, Austrian Emperor and King of Hungary Franz Josef I signed the momentous decree, the tragic consequences of which for his own empire he happily did not live to see. The immediate trigger had been the assassination, one month before of the heir to the Hapsburg throne by a Serbian terrorist; but, within a week, the war would engulf Europe's major powers. The fact that Austria-Hungary no longer even exists as such is but one testimony to the total transformation of Europe that that unfortunate war would bring about. Wars can accomplish all sorts of things and solve all sorts of problems (for example, slavery and secession in the case of the U.S. Civil War, German and Japanese imperialism in the case of World War II, Saddam Hussein's annexation of Kuwait in the case of the 1st Gulf War), problems that probably would not get solved any other way. What stands out so appallingly about World War I, however, was how little it solved and how much long-term harm it did - much more harm than any conceivable good. Of course, the small Balkan War that began on July 28, 1914, was intended to resolve the (relatively) serious problem of Serbian-inspired terrorism and its long-term threat to the stability of Austria-Hungary. And, had it remained a small Balkan War, it might perhaps have accomplished that end. 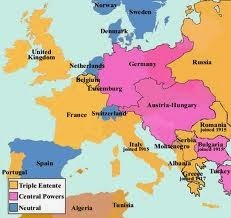 (There had, after all, been small Balkan Wars in previous years. So it was not impossible to imagine another.) But, of course, the thing about World War I was how it immediately involved the major powers and quickly became about much more than a serious but presumptively manageable Austrian-Serbian quarrel. Instead, it became something no one on either side had expected and no one had wanted, but which created a momentum all its own which no one on either side seemed to now how to stop. The lesson is not - as some sentimentally (and very foolishly) resolved in the 1920s "never again to war for king and country." But there were lessons to be learned from the civilizational suicide that was World War I - lessons that we still find it hard to assimilate adequately into our strategic thinking. If nothing else, World War I was a warning about how badly (and how quickly) things can get out of hand, how the assumptions everyone takes for granted at the beginning of a conflict may have little to do with how things actually turn out - and how hard it is for nations to backtrack, to climb back up from the brink once they have jumped over it. There is nothing new about religious persecution. It has been one of the constants of human history. And there is certainly nothing new about Muslim persecution of Christians. After all, Islam and Christianity have been in conflict off and on for much of our common history - especially since the Muslim conquest of the Holy Land from the Christian Byzantine Empire, which in turn inspired the Christian West to defend itself with the Crusades. As with all ongoing ethnic and religious conflicts, there have also been periods of calm, even cooperation. Then, after the Battle of Vienna on September 12, 1683, repulsed the Turks and saved Western Europe one final time from Turkish invasion, the Ottoman Empire went into a period of protracted but terminal decline, culminating in its dissolution after World War I (followed by secularist Turkey's formal abolition of the Caliphate in 1924). For much of the three centuries between the Battle of Vienna and the 1979 Iranian Revolution, it was perhaps possible to imagine that the historic conflict between Islamic and Western civilizations was a thing of the past. Since then however, what was once the old normal seems to have reasserted itself as the new normal! All of this has highlighted the prophetic relevance of the late political scientist Samuel P. Huntington's theory that religious and cultural identities would be a major component of international post-Cold War world conflict. In 1992 and 1993, Huntington famously proposed the theme of a "clash of civilizations" as a rebuttal of Francis Fukuyama's post-Cold War "end of history" theory. He then developed it more fully in his 1996 book, The Clash of Civilization and the Remaking of World Order. The collapse of the Soviet Union and the end of the Cold War had produced a lot of pro-democracy, neo-liberal, capitalist wishful thinking among intellectuals, who were, of course, already often imprisoned in the straightjacket of secularization theory - and thus ill-prepared and ideologically ill-disposed to accept Huntington's thesis. Huntington may not have been right in all the particulars, but he did discern an important directional change in international relations. In any event, an Islamic religious revival has obviously been underway for sometime. It was, if anything, exacerbated by the American-led destruction of Saddam Hussein's brutal but secularist regime in Iraq. It is into that particular power vacuum that ISIS has stepped, claiming to recreate the caliphate after conquering Mosul, the site of ancient Niniveh and home to a continuous Christian community presence since ancient times. 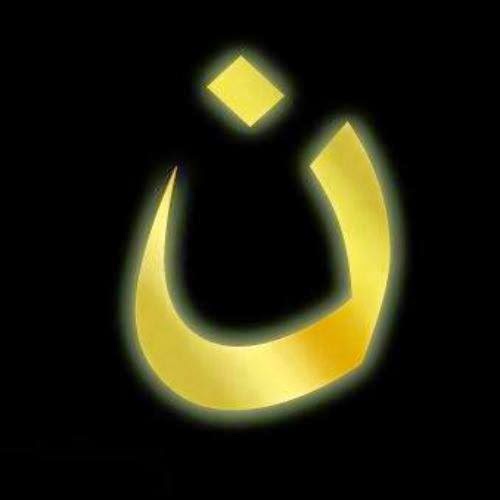 That ancient Christian community has now been driven out after Christian homes were marked with the Arabic letter "Nun," for "Nazarene" (a pejorative term for Christian). The secular West may feign indifference, but the persecution of Christians in Mosul and elsewhere is the real deal. There can now be little ambiguity about the direction of contemporary history. One hundred years ago, a Serbian terrorist assassinated an Austrian Archduke and his morganatic wife. Within a month, Austrian military action attempted to hold Serbia accountable. Unfortunately, by the beginning of August, Balkan terrorism and Austria's response had plunged most of Europe into an inferno of war which would last for another four years. Nothing good came form World War I, but a whole lot of bad did - including Communism, Naziism, Fascism, World War II, and the Cold War. It was the latter experiences (especially World War II) that seem to have taught European societies to eschew their national identities and abandon their sovereignty, with further harmful consequences such as we are witnessing now. Fast forward one hundred years. This time it wasn't an Archduke and his wife but hundreds of air travelers killed by terrorists.This time, however, Europe seems almost mute. Even the Netherlands, the nation to suffer the most casualties, seems strangely passive. An Op-Ed in today's New York Times (Arnon Grunberg, "The problem with Collective Grief") defends Dutch reticence - lest national mourning and outrage result in an expression of "nationalism." 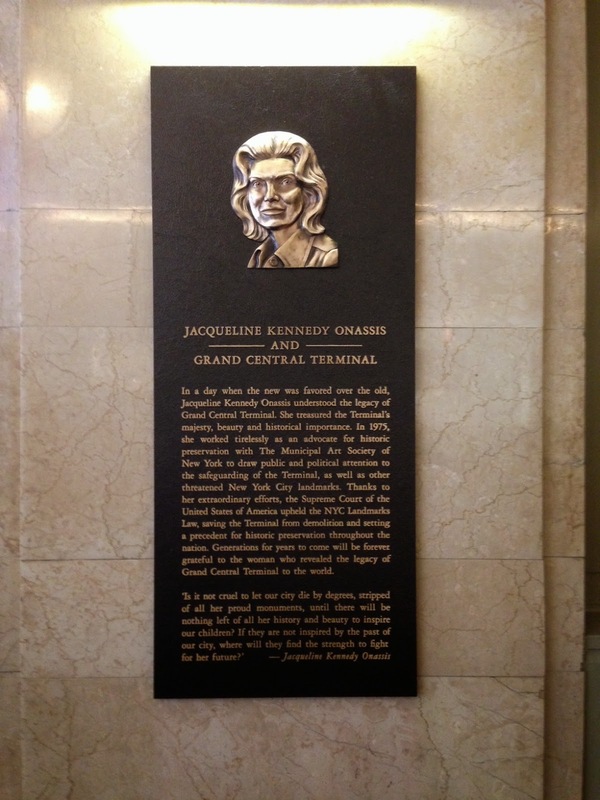 Talk about learning the wrong lesson from the 20th century's house of horrors! Of course, Europe's self-abnegation has been a long time in the making. In its origin, already during the Cold War, it was facilitated by the protective umbrella of American military might. As long as the U.S. could be counted on to counter any Soviet threat to Western Europe, Western Europe could concentrate on going shopping. On paper, those European nations remain our "allies." But they are saddled with increasingly neo-pacifist populations, an increasingly dysfunctional post-modern mentality of moral equivalence, and leadership ill-equipped to respond to the challenge of evil in the world. To make matters worse, the U.S. is becoming more like Europe - in its own culturally unique way, of course, reverting to a revived isolationism, once thought to be discredited but (like Camus' plague germs) always still there somewhere waiting to revive.The President's domestic political opponents - themselves utterly bereft of even a shred of moral or political credibility in these matters - blame the President's unimpressive leadership for the world-wide perception of American weakness. And certainly his unimpressive performance a year ago when he threatened Syria over its chemical weapons and then unceremoniously backed down did not do much for American credibility. But, of course, the fact remains that the President was reflecting the change in American public opinion that has become as allergic to the responsibilities of global leadership as Europeans have become to their own legitimate nationalism. Meanwhile, Russia resumes its troublesome role in the world. Ever since Moscow first emerged as a European power in the 17th century, its ambitions have proved problematic for Europe. The Soviet Union's 20th-century Communist ideology was an add-on, which is now mercifully for all of us consigned to the dust heap of history. But Russia and its imperial ambitions are, now as then, an indelible part of the European picture (and Asian picture and world picture). Surface-to-Air Missiles may be new, but the configuration of world power is not. When it comes to maintaining a safe international balance of power, the world has changed less than we, for whatever reason, seem to want to imagine. This summer, we are making our way, week-by-week, through Saint Paul’s letter to the Romans, which he wrote around the year 58 or so of the 1st century. It’s the longest and most studied of all Saint Paul’s letters. My first extended personal encounter with it, however, occurred some 40 years ago not from study but in a Peanuts cartoon. As I recall, Charlie Brown was moaning and groaning in his characteristic way, until finally someone said to him, “Stop sighing,” to which he responded, “It’s scriptural,” and then proceeded to cite Saint Paul’s words from the short passage we just heard today – in the more elegant, more traditional translation, for the Spirit helps us in our weakness, with sighs too deep for words. Well, of course, there really is a lot to sigh about. Just tune into to CNN, even in more ordinary weeks when commercial planes haven't been shot out of the air by terrorists. Indeed, the background for the 2 verses we just heard could be called “the problem of the present,” that is, the tension between, on the one hand, the obvious reality of the present time, the sense of overwhelming futility that seems to characterize the world, and, on the other, our hope as children of God and joint heirs with Christ. We have, Saint Paul insists, been offered an alternative, already in the present - the revelation of the children of God, empowering us to receive the word of the kingdom and so bear fruit (what Saint Paul calls the first fruits of the Spirit) by responding to its stirring call to a total reorientation of our lives. Even so, we remain burdened by what we have made of ourselves and our world. Left on our own, we would stay stuck there. Prayer, Paul seems to be suggesting, is our entrée to a different future – a future better and brighter than the present but already accessible to us now, thanks only to the presence and power of the Holy Spirit acting upon us, filling us, surrounding us, transforming us. Similarly, the parables Jesus proposes in today’s Gospel all illustrate the slow – but inexorable – progress of God’s kingdom, transforming our pathetic present into God’s glorious future. God sows his good seed in the field of the world and patiently waits until the harvest before separating the wheat from the weeds. The weeds are very real and must be recognized and dealt with eventually. But God’s judgment is patient with the world – for our sake. Because, of course, God is not at all like us! As we just heard in the book of Wisdom, God’s mastery over all things makes him lenient to all. He governs us with much lenience, thus giving us good ground for hope that he would permit our repentance. God is not at all like us! In our frustratingly futile present, we lack patience – with God, with ourselves, with one another, with our world. But, again, God is not like us! Like the yeast which, when mixed with flour, leavens the whole batch, God is patiently filling, surrounding, and transforming our world with the presence and power of his Holy Spirit. Homily for the 16th Sunday in Ordinary Time, St. Anne's Church, Walnut Creek, CA, July 20, 2014. Vacation time is, among other things, a great time to read more. My vacation reading this summer has included some serious public policy stuff (Hillary Clinton, Hard Choices) and the latest Susanna Gregory "Matthew Bartholomew" medieval mystery (Death of a Scholar). And, thanks to the HBO series The Leftovers, I have included the book by that name on which the series is based as my in-flight Kindle reading. Unlike, say, P,D. James' Children of Men, which I had read and enjoyed long before seeing the movie version, my guess is that I probably might never have read The Leftovers had my interest not been sparked by the TV show. As dystopias go, other than the bizarre premise (the sudden rapture-like disappearance of 2% of the world's population), The Leftovers does not challenge the imagination very much. Rather it uncovers the increasingly obvious fissures and dysfunctions that are very much a part of our ordinary world. Indeed, what makes it interesting is how it uses an unprecedented crisis not to bring out the good or the best in people but to highlight the sadness of so much of ordinary life, the apparent despair that seems so many modern people's daily lot.. Sadly, in the book, Rev. Jamison is a very minor, peripheral figure, publishing his obnoxious newsletter attacking the memory of the departed, but otherwise absent from the story's action. He gets none of the positive and more complex character development he got in the 3rd episode of the TV series. And, overall, the story is easier to follow in its print version. It is much clearer much earlier who is doing what and why (to the extent there can ever be an answer to why people behave in such socially destructive and personally dysfunctional ways). Reading the book part-way through the TV series might seem to spoil it. After all, I now know how it all turns out. At least, I now know how the people the book turn out. (Spoiler alert: lots of unhappiness!) It remains to be seen still what twists and turns the TV characters' stories will take. My guess is that in the TV version, as in the book, everyone gets to be sad and unhappy in his or her own way! 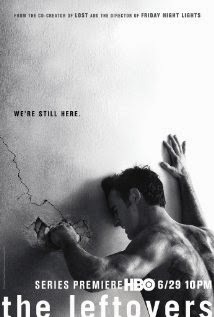 For a couple of weeks now, I have held off commenting on HBO's new TV drama series, The Leftovers (based on the novel of that name by Tom Perrotta, who is also one of the creators of the TV series). I have done so largely because I really haven't been sure yet what to make of it. I found the first episode difficult to follow. Other than the fact that 2% of the world's population had suddenly disappeared all on one October 14 three years earlier, there seemed to be an awful lot of background that was deliberately left unclear, that made it hard to follow the characters' situations in the first episode. Some of that backstory gets clearer in the second and third episodes, although many of the characters and their behavior remain still somewhat mysterious. The principal character (played quite convincingly by Justin Theroux) is Kevin Garvey, the local Chief of Police, who is struggling to maintain some semblance of normalcy in this abnormal and very depressed world. An aura of great sadness sits over the town and pervades the personal lives and relationships of virtually all of the characters, including Garvey and his family. The sadness is easy to comprehend, as is some of the bizarre behavior that ensues. While none of Garvey's immediate family disappeared on October 14, his life and family seem to have been completely destroyed by the event. His father (the former police chief) is institutionalized for apparent mental illness (presumably connected with the "departure"). His wife has abandoned him to join a cult called the Guilty Remnant, who wear white, don't speak, chain smoke, and stalk other citizens of the town. (How this cult came to be has not yet been clarified, nor have we been given much insight into why she, who did not lose loved ones on October 14, decided to abandon her family to join the cult.) Kevin's son has dropped out of college and is out west somewhere involved with a weird and dangerous guru-like figure, "Holy Wayne." Kevin's high school daughter in still at home and is involved in ostensibly normal high school-ish misbehavior, which means she behaves in predictably dysfunctional ways, which seem that much more so given the overall atmosphere of despair. Despair is the word I guess that comes most to my mind as I try to describe the characters and their lives and behavior. It reminds me a bit of P.D. James' 1992 dystopian novel The Children of Men (later made into a movie) about a world with no future, in which the human race has become sterile and stopped reproducing. That has not literally happened in The Leftovers. People presumably can still reproduce, but the past they have lost seems to have burdened their present so much that the future seems beyond any aspiration. Chief Garvey makes only one appearance in this episode. He remains the show's most attractive character, as is his seemingly quixotic effort to make his world work for him again. So far, the impression seems to be that the effort is hopeless. A sower went out to sow. How many times have we heard this parable [Matthew 13:1-23]? Years ago,when I was in seminary, one of my professors was fond of citing that familiar opening line as an example of how we have become so accustomed to hearing certain parables that, when we hear a familiar line like that, we already know what follows and how it is going to end, and so our tendency is to start to tune out – which, of course, is one of the very things the parable is warning us not to do! That is certainly a real problem - one which inevitably accompanies the repeated proclamation of familiar words and stories. The remedy for that is learning to pay attention in a new way, learning to re-hear old words and stories as if they were being told for the first time, Admittedly that is something of a challenge and takes effort, but it is hardly impossible. In fact, it might be suggested that it is one of the specific surprises grace can accomplish in our otherwise routine and predictable human condition. It is what transforms our ears into ears that can hear! But hearing this story remains a challenge on numerous levels. Having lived virtually all my life in cities, parables about farmers sowing seed sound somewhat exotic to me – and, maybe more than exotic actually somewhat strange. What exactly is the farmer doing? Why does he sow his seed in such a seemingly random sort of way? Of course, Jesus’ actual hearers – the original audience for this parable - would have understood that Israel’s arid climate and rocky soil are not very farmer-friendly. Finding in advance the pockets of good fertile soil, with the limited technology available to traditional agriculture, would have been be very difficult - and inefficient. Throwing the seed all over the place may mean a lot will be wasted, but it probably guarantees that some will fall on good soil and take root and produce fruit. So what may seem to us like inefficiency turns out to be really quite efficient indeed on the farmer's part.! Jesus uses this familiar fact to say something about how God produces fruit in the world, reaching out to us with extravagant generosity, recognizing that maybe not everyone will respond – nor, having responded, really persevere. Even so, God persists in revealing himself as widely as possible, in many and various ways. He does that because that is who God is and how God acts – and how he expects his Church to behave in imitation of him. And that is why God’s extravagant generosity invites such an extravagantly faithful response on our part – producing fruit as much as a hundred-fold. As Pope Francis has exhorted us: The Church which “goes forth” is a community of missionary disciples who take the first step, who are involved and supportive, who bear fruit and rejoice. … Such a community has an endless desire to show mercy, the fruit of its own experience of the power of the Father’s infinite mercy. … Evangelization consists mostly of patience and disregard for constraints of time. Faithful to the Lord’s gift, it also bears fruit. An evangelizing community is always concerned with fruit, because the Lord wants her to be fruitful. … The sower, when he sees weeds sprouting among the grain does not grumble or overreact. He or she finds a way to let the word take flesh in a particular situation and bear fruits of new life, however imperfect or incomplete these may appear [Evangelii Gaudium, 24]. Homily for the 15th Sunday in Ordinary Time, Immaculate Conception Church, Knoxville, TN, July 13, 2014. Over at the often interesting and intellectually somewhat serious, politically rightward oriented site First Things, R.R. Reno today makes the provocative proposal, that New York's Penn Station be rebuilt: http://www.firstthings.com/web-exclusives/2014/07/rebuild-penn-station. For anyone unfamiliar with the sad saga of the original Penn Station - as well as for everyone who is - his article is well worth reading. Reno recalls the architectural beauty and grandeur of the once monumental station and its wanton destruction in the 1960s, when such cultural vandalism was what passed for being on the right ride of history among our social and cultural elites. Only after the station had been demolished did the full realization of what had been done and what had been lost begin to sink in among the citizenry of the city - fortunately in time to save Grand Central Station from a similar tragic fate. 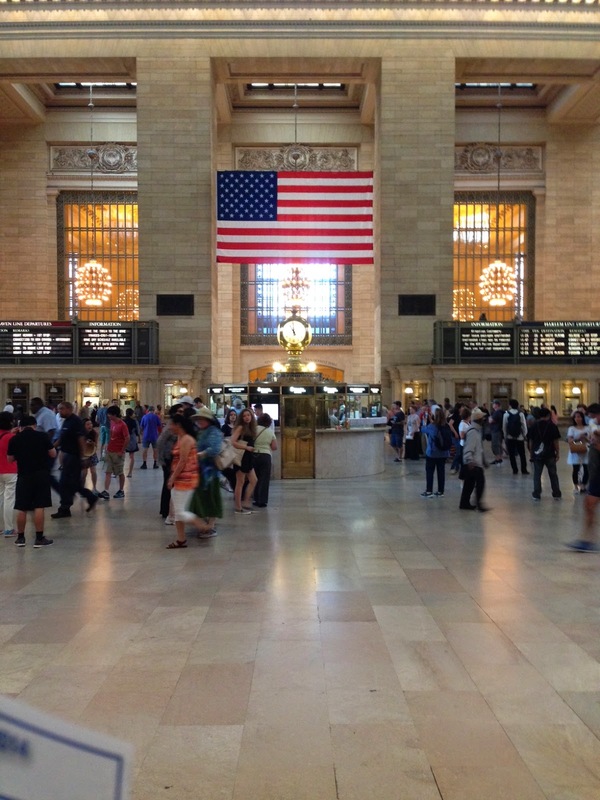 Reno approvingly quotes the architectural critic Vincent Scully's famous line that through the old Penn Station, "one entered the city like a god," while now instead "one scuttles in now like a rat." On its face, Reno's suggestion seems almost absurd. Our society has rendered itself incapable of building or undertaking anything of consequence - due in large measure to the destructive anti-tax, anti-government mentality embraced and fostered by so many of Reno's magazine's would-be political allies on the right. That mentality is both anti-community and anti-future. Hence our national inability to repair and rebuild our decaying infrastructure, not to mention our collapsing educational system, and our dysfunctional non-response to the impact of global climate change. It's been a long time since the U.S. put a man on the moon - a long time since we as a society have been able to articulate any comparably ambitious common goal! That said, Reno makes a cogent case for the feasibility of rebuilding Penn Station. He reminds us how European cities reconstructed so many of their historical buildings that had been bombed during World War II or deliberately destroyed by the Communists. He does not mention it, but I have personally long been fascinated by and rooting for the proposal to rebuild the Hohenzollern Imperial Palace (or at least its facade) in Berlin - a site doubly scarred, first by wartime bombing and then by Communist construction. Reno is quite clear that what he is talking about is a retrieval of what was lost - not some new modern station. He warns that "our cultural leaders don't want a beautiful classical building. They want something 'new and exciting,' which invariably means a building that looks like an airline terminal." Such has been the fate of so much of our public space in the last half century, which, as Reno observes, reflects "the style of our global corporate culture" rather than an "American civic culture." In this regard, I think also of all the ugly modern churches that have been built in the past half-century or so! 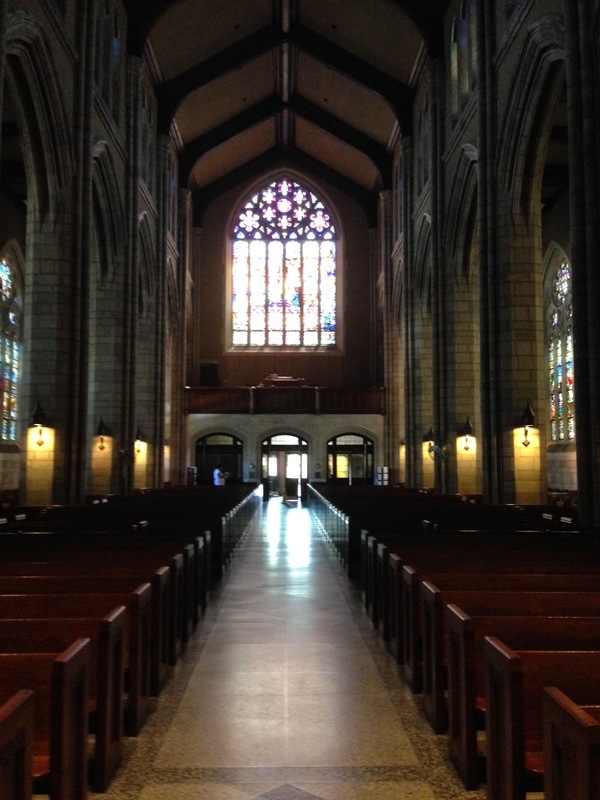 Like civic buildings, churches represent archetypical public places, and an important public function of a church is to be beautiful - something modern elites unduly concerned with being on the right side of history have again so sadly ignored. In this era of increasing inequality and the faux populist rhetoric it is inspiring, Reno concludes with this powerful, very much to the point observation: "The really rich in New York don't have to put up with the current Penn Station. They have limos and drivers and private jets. But the rest of us must share our public spaces." Sharing, of course, is what makes a public space public, what makes a community a community, what makes a society a society, what enriches our present and makes possible a future worth working towards for generations to come. 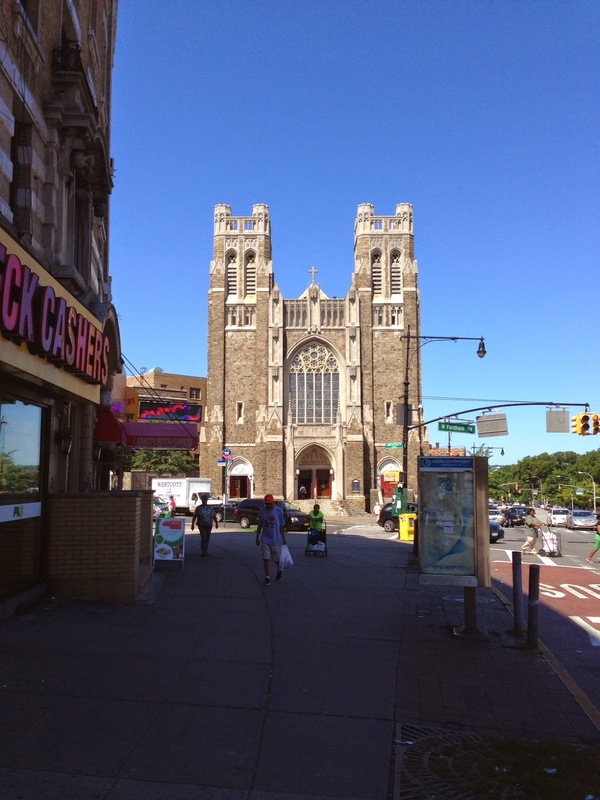 This morning, I took the D Train to the Bronx and walked west on Fordham Road to explore my old neighborhood, still dominated (visually at least) by the great Gothic Towers of Saint Nicholas of Tolentine Church. Walking west on Fordham from the Grand Concourse, my first reaction was how much has changed and how little has changed. The storefronts are all different. I didn't see any stores I remembered in the old buildings. But the buildings, of course, are still the same. More importantly, the hustle and bustle, the crowded busy-ness of Fordham Road was essentially the same. The people populating and shopping on that famous street are ethnically different from the crowds of 50 years ago, but they are basically doing the same things! At Jerome Avenue, Tolentine's great Gothic towers appeared a few blocks away. I crossed Davidson Avenue, then Grand Avenue, passed where Weber's Bakery once nourished a neighborhood, then passed the Aqueduct, and stood at last in front of my childhood address - 2374 University Avenue. 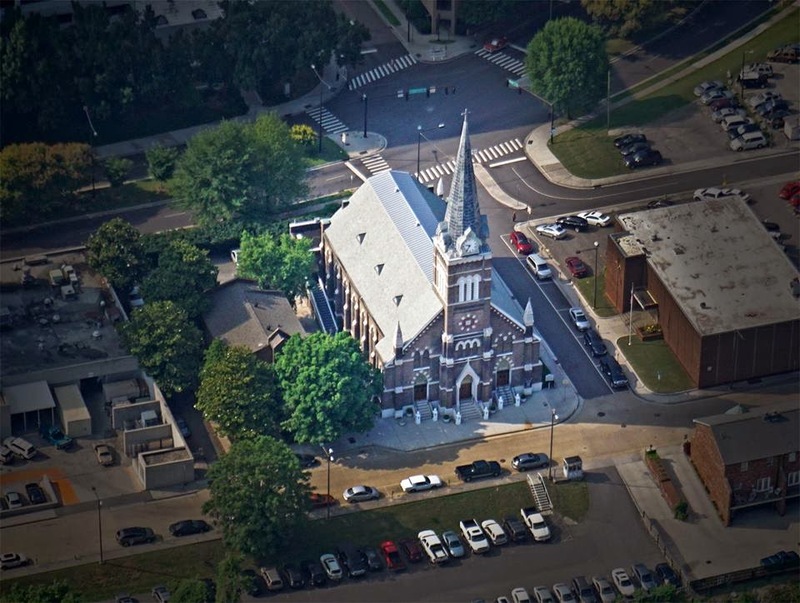 Again, while the 1st-floor storefronts were all different, and even the front entrance slightly altered, the building itself - a sold brown brick, 3-sided curved building dating back to around the beginning of the 20th century - stood in its solitary separateness across University Avenue from the church. 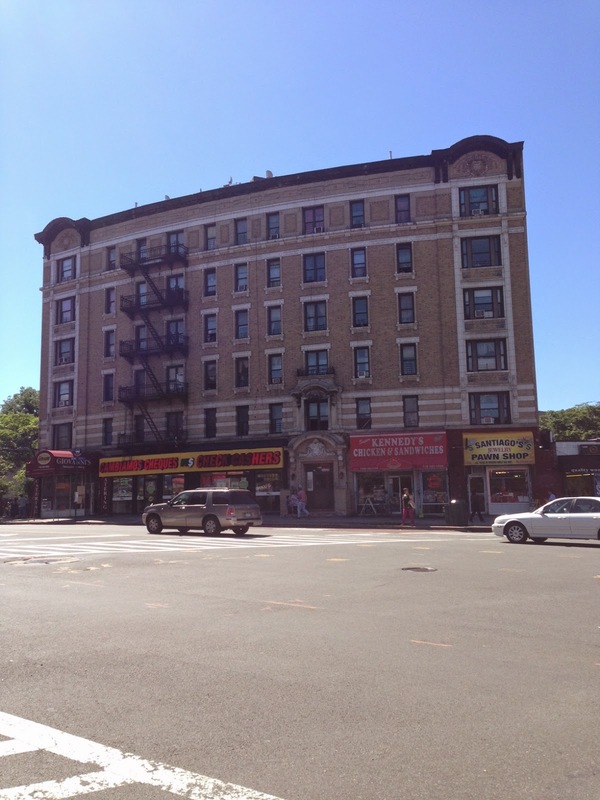 I couldn't resist crossing Fordham Road to Devoe park to photograph 2374 in all its solitary splendor! Then, back across the street to the church - in its time the unquestioned community center of the neighborhood. How well I recall the crowds spilling out of the church - upstairs and downstairs - on Sundays after each of the 13 Masses. The Lower Church is no more - converted decades ago to other parish uses. But the great Upper Church is little changed on the outside, and I found it only moderately altered on the inside. Its dark Gothic nave was as long and impressive as ever. 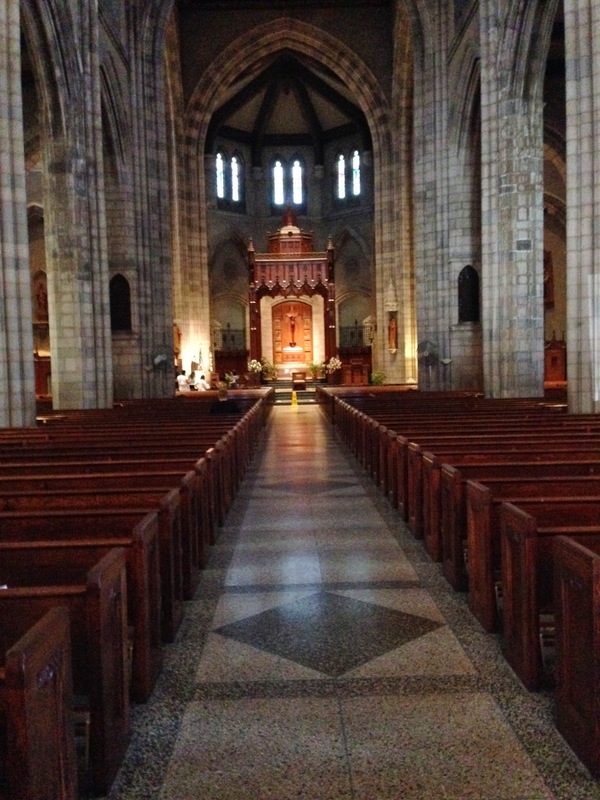 The baldachin still stood over the altar. The light from outside still streamed through great window which portrays Saint Nicholas of Tolentine celebrating Mass and interceding for the souls in Purgatory (whose patron saint he is). 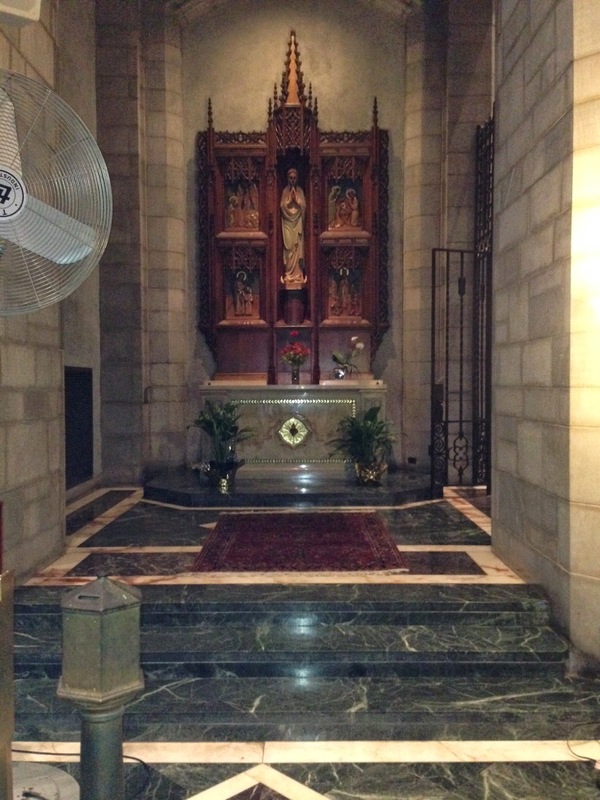 The two principal side altars - to the Sacred Heart and to the BVM -have also for some reason been reversed in relation to the main altar, but have otherwise been well preserved. I think the Augustinians deserve great credit for maintaining this beautiful building as an attractive place of prayer and worship and thus the center of a still vibrant, and now multi-cultural, multi-lingual (English, Spanish, Vietnamese) parish community. It was a treat to walk around the old neighborhood today, but it was a special delight to spend time in reminiscence and prayer in the church that sanctified my early years. In my early years, public libraries were special places for me. There I found frequent refuge from a less than welcoming world, while exploring - through the blessing of books - a more interesting and expansive one. As years passed (and turned into decades), bookstores replaced libraries for me as that special sort of sanctuary. 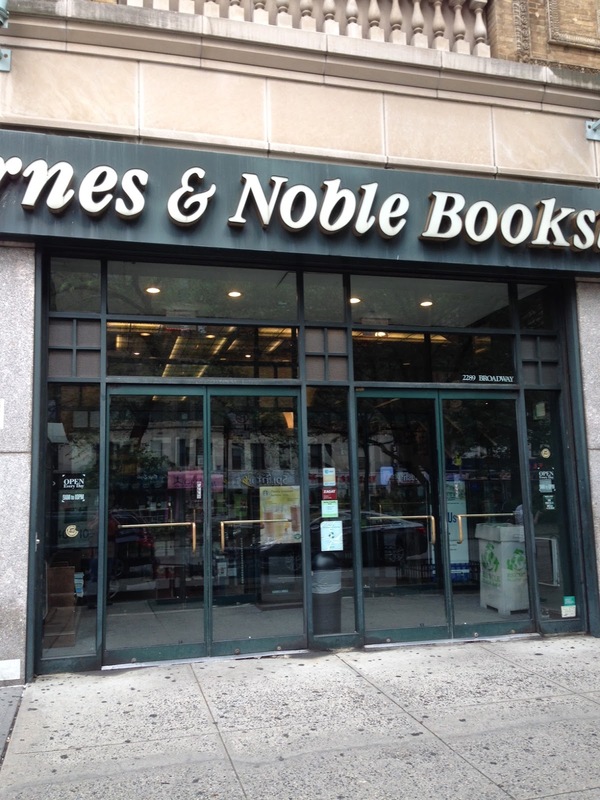 In the 90s, I regularly walked the mile or so to Barnes & Noble at Broadway & 82nd Street. Then, for 10 happy years after moving back to Manhattan, I had access to a closer and bigger branch, augmented by an even closer Borders Bookstore at Columbus Circle. Both of which, however, have long since been closed. So today I schlepped (not by foot this time, but by bus) back up to the 82nd Street Barnes & Noble, the only such bookstore left on the Upper West Side. What does it mean that bookstores are dying off - not just here in Manhattan but all over the country? Nor are big chains the only ones so imperiled. The same fate has befallen so many big and small independent bookstores, both urban neighborhood and small town treasures alike. Such is progress - the "creative destruction" of a capitalist economy. The publishing industry - specifically the economics of the publishing industry - continue to change. And who can say what will be in 5 years, 10 years, 50 years? What kinds of books (real books, e-books) will exist? Will reading still liberate us? I have no insights into the economics of publishing. I can only comment on what we all observe - the growing vacancy in our culture. As I skimmed several books today - books I had not heard of or read reviews of and might never have encountered had I not had a place to browse, I reflected on how much less that happens on line, where one is more likely to be looking for something specific and being pointed in particular directions. And then, of course, there is the whole community gathering place, local hang-out role that traditional stores perform in so many neighborhoods and towns. For now at least, it was a quiet but still glorious Fourth, surrounded by an abundance of books and a community of urban book-lovers. A "War on Women” makes for a good campaign and fundraising slogan, however, and my guess is that much of the intense angst we are witnessing will work its way quickly into the mid-term campaign. And, given the fairly broad consensus in our society in favor of easy access to contraception, I would anticipate that it may well prove an effective issue in the campaign. The fact that an alternative is available – already exists – to guarantee contraception coverage clearly shows the factual falsehood of current “war on women” claims. So why the fuss? What was clearly at stake here in this case was not whether women could get easy access to contraception coverage but whether other citizens (in this case, their employers) would be coerced into being accomplices to serve the extreme ideology of an expansive secularist state apparatus. From that ideological vantage point, of course, it might seem to make sense to prioritize such coerced cooperation, thereby institutionalizing the supremacy of secularist ideology and definitively privatizing contrary points of view (especially religious beliefs). Yesterdays's Supreme Court decision is not likely to limit anyone's access to contraception. But it is a step toward restoring balance to our public life by acknowledging the legitimacy of multiple perspectives (including religious beliefs) - just in private but in the public square.